It’s the smell that pervades your car from miles away as you speed down a backwoods road. It makes your foot come off the accelerator and your mouth start watering. When you smell it, lunch becomes very important while your final destination can wait. The smoke is the telltale sign, but its the aroma of mesquite, applewood, or hickory that lets you know BBQ is in the vicinity. As I write, this is what my house smells like. It’s making me crazy hungry and also causing me to have crazy thoughts. I’m actually praying that this smoky smell of BBQ pork straight from heaven itself will find its way into the upholstery and rugs of my house and stay there. I have no need for Glade air fresheners when my whole house smells deliciously like the BBQ place off of US-319 in backwoods Georgia. I am content and happy and I haven’t even tried the pork yet. My mother first introduced me to slow cooker pulled pork. She has a fabulous recipe that takes advantage of pungent onions and vinegar to make a BBQ in that Eastern Carolina tradition. 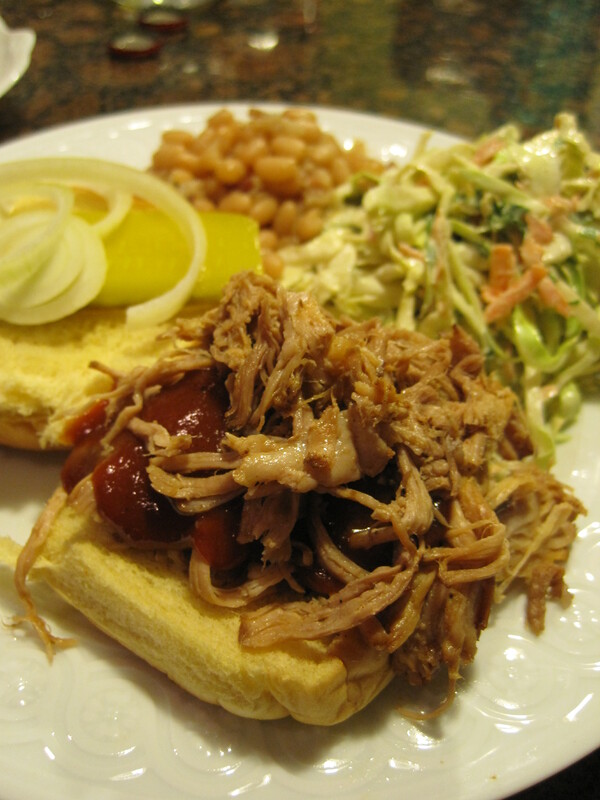 It’s delicious and has been my standby recipe for pulled pork for years now. But on a recent run, I was listening to a podcast of public radio’s The Splendid Table and learned about slow cooker pulled pork with liquid smoke. At first I was skeptical. Liquid smoke sounds like cancer in a bottle to me and I wasn’t sure I was alright with pouring 1/2 cup of it over my dinner. So I did a little research. And I learned that liquid smoke is essentially condensed smoke vapors. These vapors are then filtered and aged depending on the brand. Still not exactly up there with carrots and apples, but liquid smoke wasn’t just chemicals in a bottle either. The website CHOW has a helpful article on liquid smoke that discussed the differences between brands and I eventually chose hickory-flavored liquid smoke from Colgin. The fact that I went looking for the liquid smoke in the charcoal section of my grocery store shows that I remained a little skeptical of the healthiness of this product, but I had convinced myself it was at least worth a try. Just so you know, liquid smoke is usually placed with the BBQ sauces at your local grocery store. The recipe itself could not be easier and is perfect for pulling together before you head out the door to work. It takes about five minutes to make and then all you have to do is wait. The recipe on The Splendid Table’s website says that you can cook it on the high or low setting of your slow cooker. I opted for low, because when it comes to BBQ you can’t argue with low and slow. It took about 10 hours for the BBQ to cook, but it was worth it. So tender, I had to use a spoon to get it out of the slow cooker it tasted great on a bun with some onions, a slice of pickle, and my favorite BBQ sauce. And the best part? Friends and family will swear that you spent hours barbecuing this pork. Thanks to the liquid smoke it tastes like the real deal while the slow cooker takes the work out of barbecuing. I’m a convert! Hardly adapted from Cheater BBQ: Barbecue Anytime, Anywhere, In Any Weather by Mindy Merrell and R.B. Quinn as posted on The Splendid Table website. This recipe makes plenty of BBQ and thankfully freezes well. If freezing, spoon some of the reserved BBQ juices from the slow cooker in with the BBQ so that it won’t dry out when reheating. Cut the pork shoulder into 3 large pieces. In a small bowl, combine the paprika, garlic powder, dry mustard, kosher salt, and freshly ground black pepper. 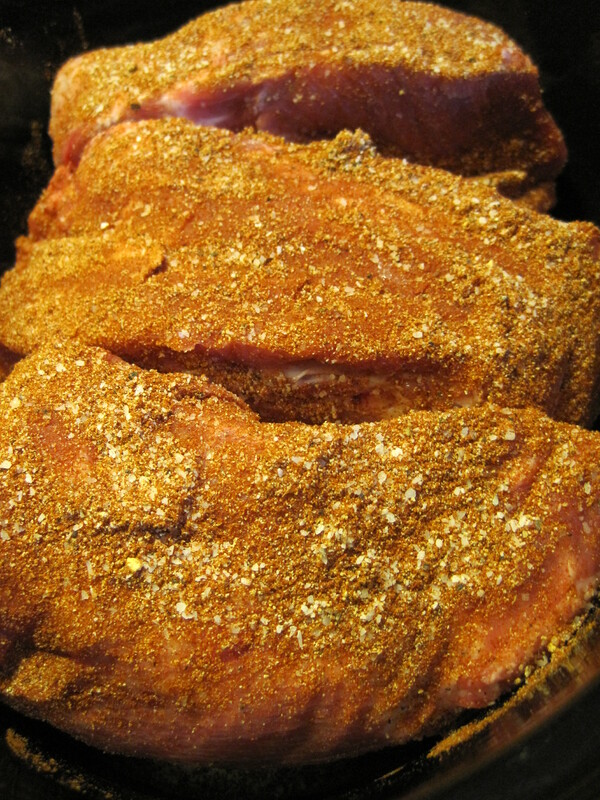 Rub the spices over the pork shoulder pieces. 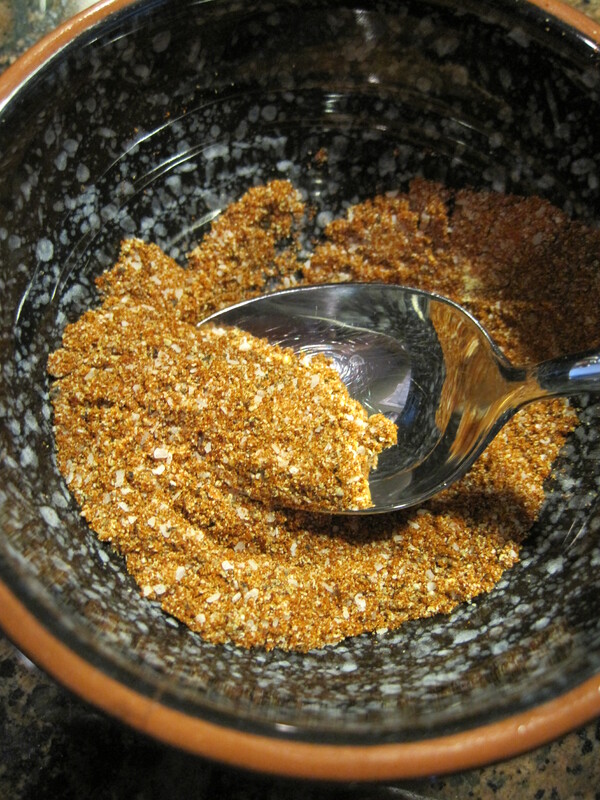 You may not need all the dry rub and the remaining dry rub may be saved for a later use. Place the rubbed pork pieces in the slower cooker and pour the liquid smoke over them. 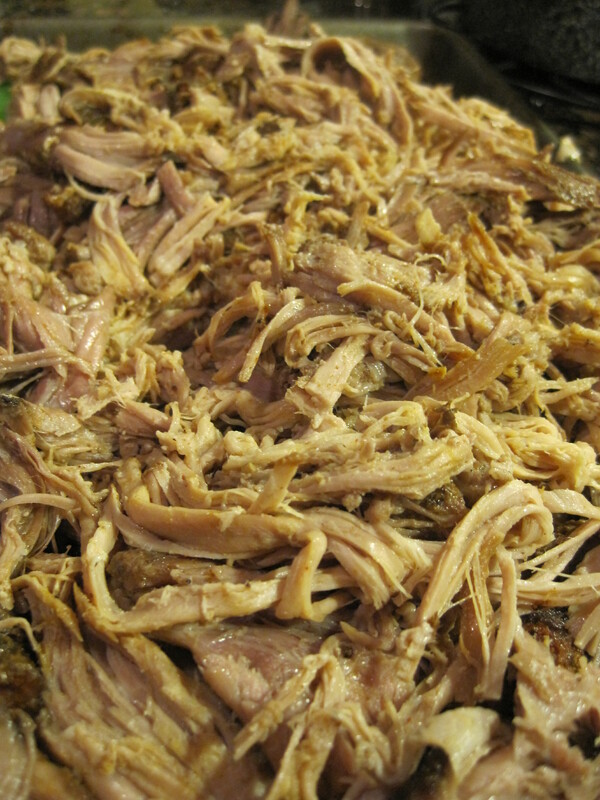 Cover the slow cooker and cook on low for ten hours or until the pork is very tender and shreds easily. If crunched for time, you can cook the pork on high for 5 to 6 hours. 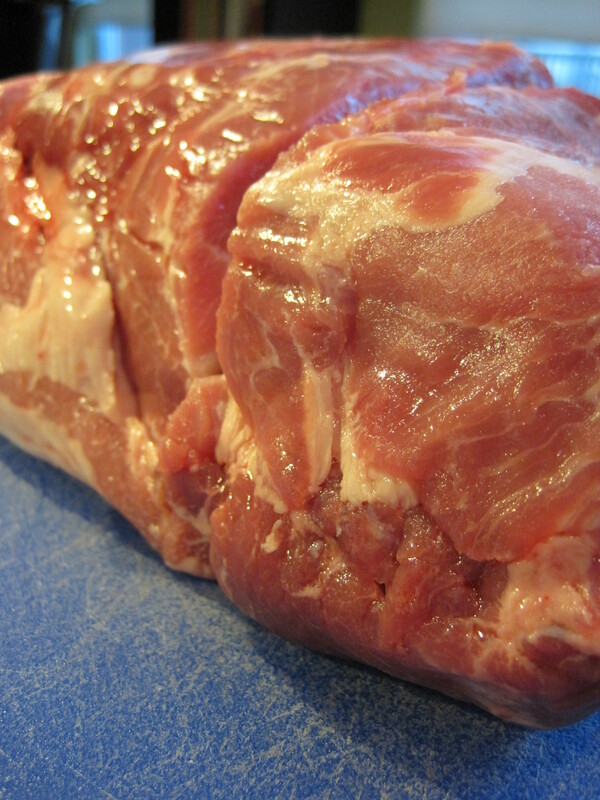 Once cooked, remove the pork from the slow cooker and place on a cutting board. Shred or chop the pork using a fork or large cleaver, respectively. Serve the pork on a bun with your favorite BBQ sauce, sliced pickles, onions, and, of course, plenty of napkins! Jay’s been wanting to use the slow cooker and I think this just might be the ticket to get him started! Another snowy NC weekend may be approaching so I’ll be sure to have the ingredients on hand. What’s your favorite BBQ sauce? Made this last week for some friends and used Stubbs Spicy BBQ Sauce, great stuff! My favorite BBQ sauce ever is from this little shack of a place right of I95 on the GA/FL border called “G-Daddy’s BBQ.” It’s a Georgia mustard sauce, and if you call them, they’ll mail it to you. If you’re driving that way though, it’s definitely worth stopping in! We are having a 3rd of July BBQ party at work so I am going to give this a try. Hope it’s what you say… but anyway my favorite BBQ sauce is from Tyler Florence, from the Food Network. I think its called Tyler’s Ultimate BBQ Sauce. It takes a little work but WELL WORTH IT!! I think it will be a hit with your coworkers! Let me know how what you think and enjoy your 4th (or 3rd!). It was a hit!! Not only did it taste like it was smoked, it was soooo easy! I actually used only 1/3 cup of the smoke to be on the cautious side. We are having a family reunion next summer and this is on the list. Thank you for sharing. Yeah! So glad it turned out well and so appreciate you letting me know it was a success! Happy cooking!